Training included attending three courses in the computer science department (Algorithms, Topics in Big Data, & Program Design and Data Structures for Scientific Computing), as well as collaborating on methods development for large scale statistical inference and sensitivity to unmeasured confounding analyses. Perform statistical analyses and large-scale inference on a retrospective national cohort of 411,055 Veterans Health Administration patients. Experience with manipulating and analyzing large datasets, as well as integrating data from multiple sources, such as the National Death Index, Medicare, and Medicaid. Current focus is the association between diabetes medications and congestive heart failure. Worked under Nancy Obuchowski on multi-reader multi-case ROC analyses. Conducted a examining the effect of location bias in two large MRMC ROC studies, comparing three ROC scoring methods. Compared one method that only uses the maximum confidence score and does not take location bias into account (maxROC), and two methods that take location bias into account: the region of interest ROC (ROI-ROC) and the free-response ROC (FROC). Created custom labor curves based on women in labor’s individual characteristics. Obtained model estimates and 95% confidence intervals for the custom labor curves using bootstrap resampling methods. Performed microarray analysis using programs such as R and Partek to determine unique transcripts. Worked with researchers to prioritize transcripts for validation. Began as a research assistant and promoted to statistical data analyst position. Experience in planning and executing analytical projects. Lead survey data manager for Center for Outpatient Health Study focusing on health literacy. 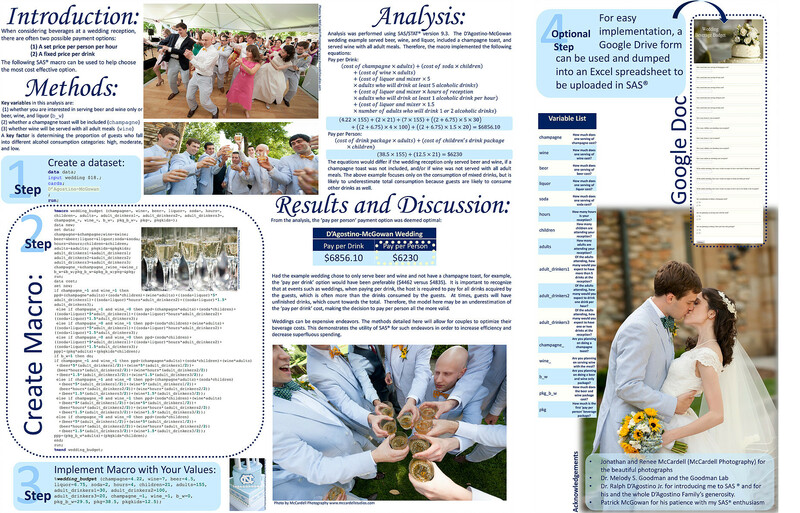 Performed statistical analyses including univariate, bivariate, multivariate, and mixed methods. 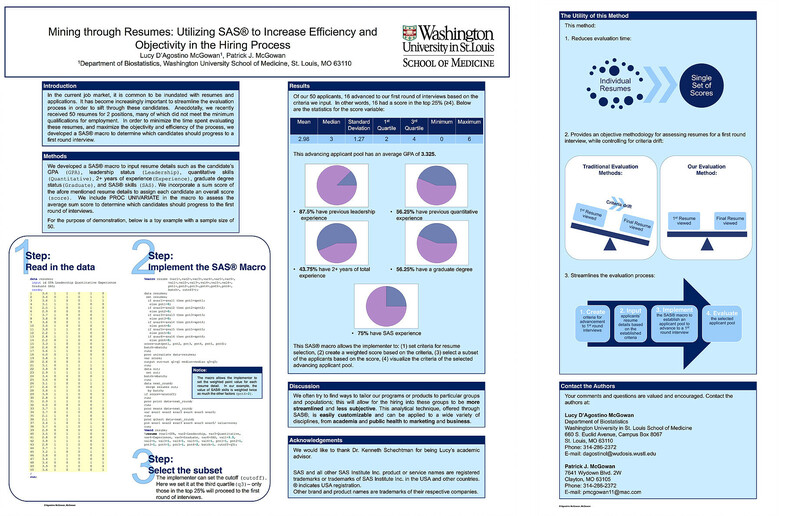 Extensive SAS experience in analyzing large datasets including data step processing, data manipulation, macro creation, data mining, regression analyses, survival analyses, and two-time winner of SAS Student Ambassador award. Ryan Jarrett, Lucy D’Agostino McGowan, “Assessing the Association Between Accident Injury Severity and NCAP Car Safety Ratings”." tipr: An R package with tools for conducting tipping point sensitivity analyses. googledrive: An R package that interfaces with Google Drive from R, allowing users to seamlessly manage files on Google Drive from the comfort of their console. contributr: A Shiny Application developed in collaboration with Maelle and rOpenSci for finding beginner GitHub issues to contribute to. datasauRus: An R package made in collaboration with Steph Locke consisting of The Datasaurus Dozen, a set of datasets with the same summary statistics. They retain the same summary statistics despite having radically different distributions. The datasets represent a larger and quirkier object lesson that is typically taught via Anscombe’s Quartet. cowsay: An R package that allows printing of character strings as messages/warnings/etc. with ASCII animals, including cats, cows, frogs, chickens, ghosts, and more. RJafroc: And R package for analyzing data acquired using the Receiver Operating Characteristic paradigm and its extensions. Blume JD, D’Agostino McGowan L, Dupont WD, Greevy Jr RA (2018). “Second-generation p-values: Improved rigor, reproducibility, & transparency in statistical analyses.” PloS one, 13(3), e0188299. Murff HJ, Roumie CL, Greevy RA, Hackstadt AJ, D’Agostino McGowan L, Hung AM, Grijalva CG, Griffin MR (2018). “Metformin use and incidence cancer risk: evidence for a selective protective effect against liver cancer.” Cancer causes & control : CCC, 27(10), 1-10. D’Agostino McGowan L, Roumie CL (2018). “Sulfonylureas as second line treatment for type 2 diabetes.” BMJ, 362. D’Agostino McGowan L (2018). Improving Modern Techniques of Causal Inference: Finite Sample Performance of ATM and ATO Doubly Robust Estimators, Variance Estimation for ATO Estimators, and Contextualized Tipping Point Sensitivity Analyses for Unmeasured Confounding. PhD thesis, Vanderbilt University. Roumie CL, Min JY, D’Agostino McGowan L, Presley C, Grijalva CG, Hackstadt AJ, Hung AM, Greevy RA, Elasy T, Griffin MR (2017). “Comparative safety of sulfonylurea and metformin monotherapy on the risk of heart failure: a cohort study.” Journal of the American Heart Association, 6(4), e005379. D’Agostino McGowan L, Bullen JA, Obuchowski NA (2016). “Location bias in ROC studies.” Statistics in Biopharmaceutical Research, 8(3), 258-267. Drake BF, Brown K, D’Agostino McGowan L, Haslag-Minoff J, Kaphingst K (2016). “Secondary consent to biospecimen use in a prostate cancer biorepository.” BMC research notes, 9(1), 346. Kaphingst KA, Stafford JD, D’Agostino McGowan L, Seo J, Lachance CR, Goodman MS (2015). “Effects of racial and ethnic group and health literacy on responses to genomic risk information in a medically underserved population.” Health Psychology, 34(2), 101. Chen Y, D’Agostino McGowan L, Cimino PJ, Dahiya S, Leonard JR, Lee DY, Gutmann DH (2015). “Mouse low-grade gliomas contain cancer stem cells with unique molecular and functional properties.” Cell reports, 10(11), 1899-1912. D’Agostino McGowan L, Stafford JD, Thompson VL, Johnson-Javois B, Goodman MS (2015). “Quantitative evaluation of the community research fellows training program.” Frontiers in public health, 3, 179. Colditz GA, D’Agostino McGowan L, James AS, Bohlke K, Goodman MS (2014). “Screening for colorectal cancer: Using data to set prevention priorities.” Cancer Causes & Control, 25(1), 93-98. Diggs-Andrews KA, Brown JA, Gianino SM, D’Agostino McGowan L, Rubin JB, Wozniak DF, Gutmann DH (2014). “reply.” Annals of neurology, 75(5), 800-801. Fisher MJ, Loguidice M, Gutmann DH, Listernick R, Ferner RE, Ullrich NJ, Packer RJ, Tabori U, Hoffman RO, Ardern-Holmes SL, Hummel TR, Hargrave DR, Bouffet E, Charrow J, Bilaniuk LT, Balcer LJ, D’Agostino McGowan L, Liu GT (2014). “Gender as a disease modifier in neurofibromatosis type 1 optic pathway glioma.” Annals of Neurology, 75(5), 799-800. Griffey RT, Kennedy SK, D’Agostino McGowan L, Goodman M, Kaphingst KA (2014). “Is low health literacy associated with increased emergency department utilization and recidivism?” Academic Emergency Medicine, 21(10), 1109-1115. D’Agostino McGowan L, Gennarelli RL, Lyons SA, Goodman MS (2013). 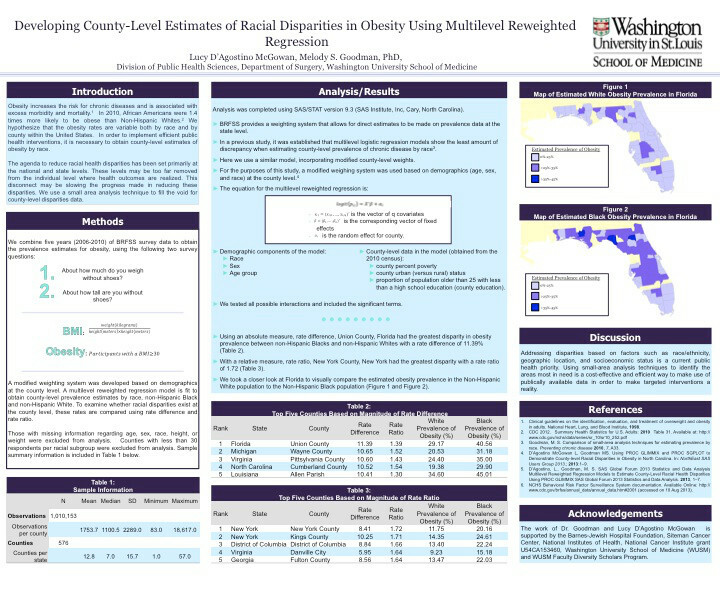 “Using small-area analysis to estimate county-level racial disparities in obesity demonstrating the necessity of targeted interventions.” International journal of environmental research and public health, 11(1), 418-428.